This cemetery is located on Brushy Creek Church Road between Sparks and Chaserville in Cook County, Georgia. You can reach the cemetery from Exit 41 on Interstate Highway 75 at Sparks, Georgia. Follow Colquett Street east into Sparks from I-75. After Colquett Street crosses US Highway 41 in Sparks it becomes Brushy Creek Road. Follow Brushy Creek Road northerly until you come to the intersection (4 way stop) with County Road 253 (Barneyville Road). Turn right onto CR-253 and follow it until the junction of Brushy Creek Church Road which is on the left. There is a sign for the Brushy Creek Baptist Church at this junction. Turn left and follow Brushy Creek Church Road until you get to the church. The cemetery is at the church. This cemetery is listed on FindAGrave.com and the more than 800 burials can be searched there. The link is Brushy Creek Cemetery. Sion Hall Pike, Jr. is buried in this cemetery together with Jane, Malinda and Nancy Ivey. He is thought to be the illegitimate son of Sion Hall Pike, Sr. and either Nancy Ivey or Nancy's daughter, Jane. Their graves are located in the north-east quadrant of the cemetery and the information is shown below. I have included the grave of Sims W. Griffin which is adjacent to Jane Ivey's grave. Some sources identify Sims Griffin as the son of Jane Ivey and John Griffin. Click here for a larger (49K) and more detailed version of the above photo. 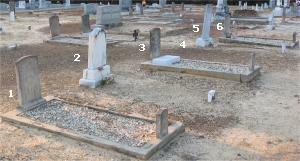 Transcriptions of the headstones and photographs of the five individual graves and headstones are below.